On our recent trip to South Dakota, there were quite a few exciting moments. Bears brushed up against our car in Bear Country USA, the police came to visit us because someone thought they saw a “domestic disturbance” in our car and a hike to split rock resulted in our being covered with ticks. Despite all the excitement, there is one story that stands apart from the rest. This is that story. This, is Snappy’s story. On our way out the door for one of three-or-so-a-day hike’s, the neighbor down he road from out cabin waved us over. When we got close, we found a very large turtle on the front lawn. It was big, green, cranky, and clearly out of place. There is a small pond behind this cabin, and sometimes when there is heavy rain one or two of these suckers will get washed downstream and end up there. It was a common snapping turtle, and they are very aggressive. The kids actually listened to me for once and observed it from a healthy distance. Kenny wandered down from up the hill and we started talking about what to do with the thing. 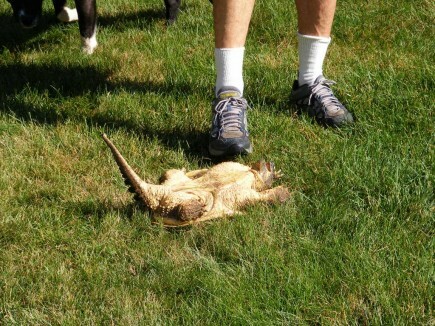 Pat wanted to kill it, because it was dangerous for her tiny geriatric dog. 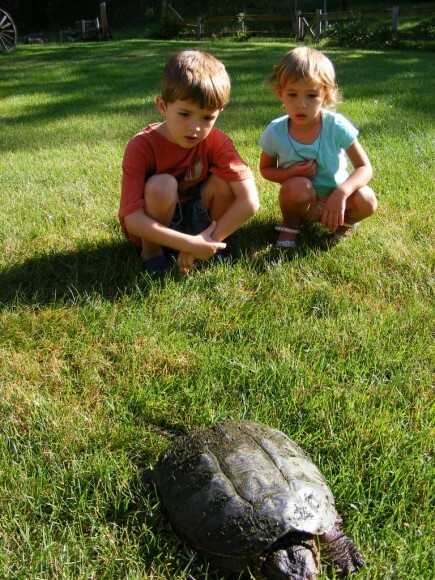 It was about this time that Kenny asked the kid’s to name the turtle. They discussed it and came up with the name “Snappy”. Even if I had wanted to kill the turtle, which I didn’t, I couldn’t do something like that after the kids named it. Now that we have a name, get in for a closer look. 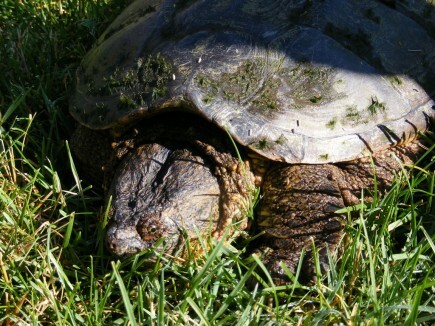 Snappy appears to be wise beyond…. it’s years. 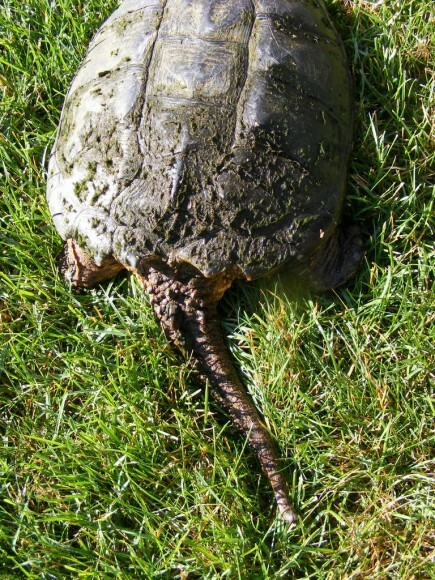 Just how do you determine the gender of a turtle, anyway. Look at the size of Snappy’s tail! The neck was about the same length when Snappy was provoked enough to stick it’s head out all the way. I didn’t manage to get a picture of that though. 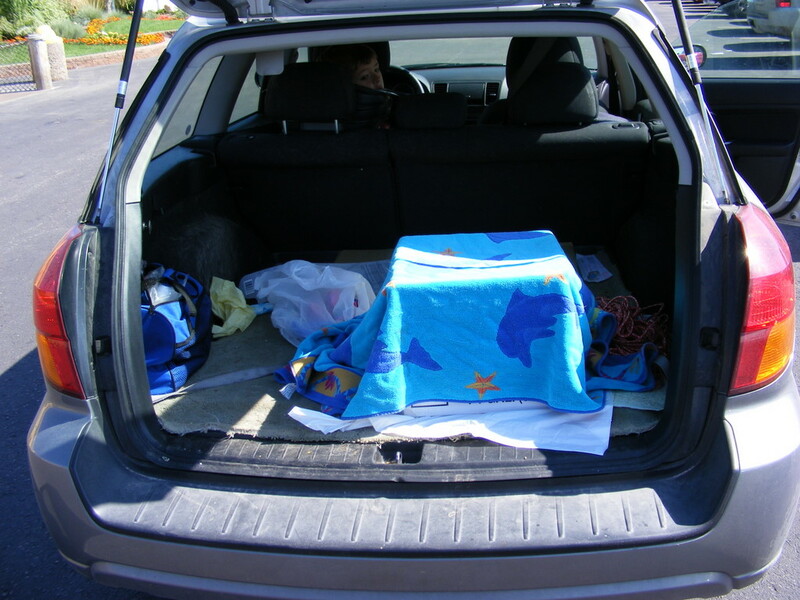 The kids wandered away with mom, but I stayed behind to see things through. Kenny began flipping the thing over with his foot. I’m still not sure why. 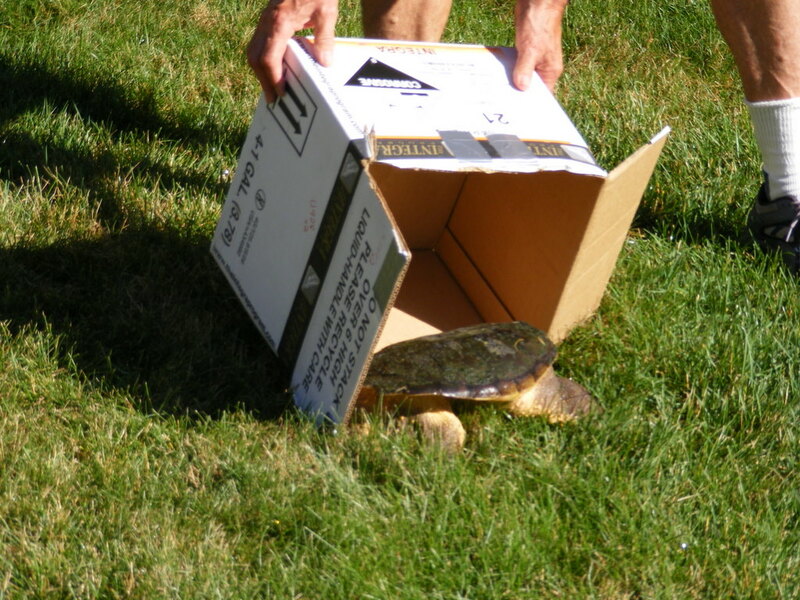 After sufficient torture, I suggested we move Snappy to a box of some kind, so that the dog wouldn’t be in danger and Snappy would be less likely to be killed. Kenny found a high tech container and we coaxed Snappy in. There is a tourist attraction just up the road from the cabin called Reptile Gardens that houses hundreds of creatures of this sort. 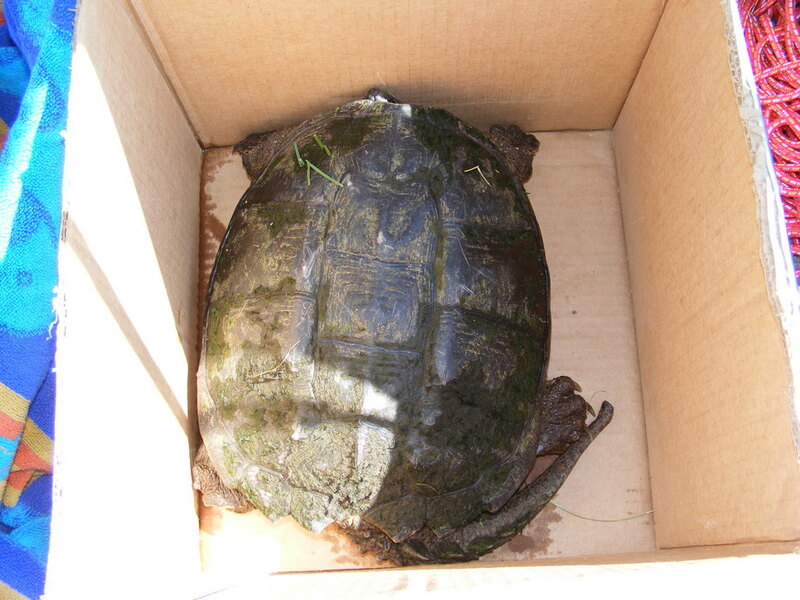 I had Kenny give them a call to see if they would be willing to take Snappy into custody and give… it a nice home. They graciously accepted, so we loaded Snappy into the Subaru and carted him over there. 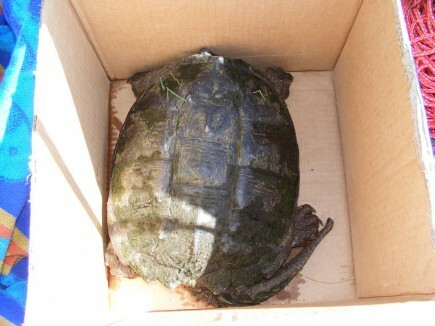 The nice man in the picture is carrying Snappy to a nice new home. Snappy will live the rest of his or her days in relative luxury, not having to worry about finding food or encountering homicidal dog owners. The kids were sad to see her go, but I told them we will visit Snappy next time we come to South Dakota, which is normally about once a year. 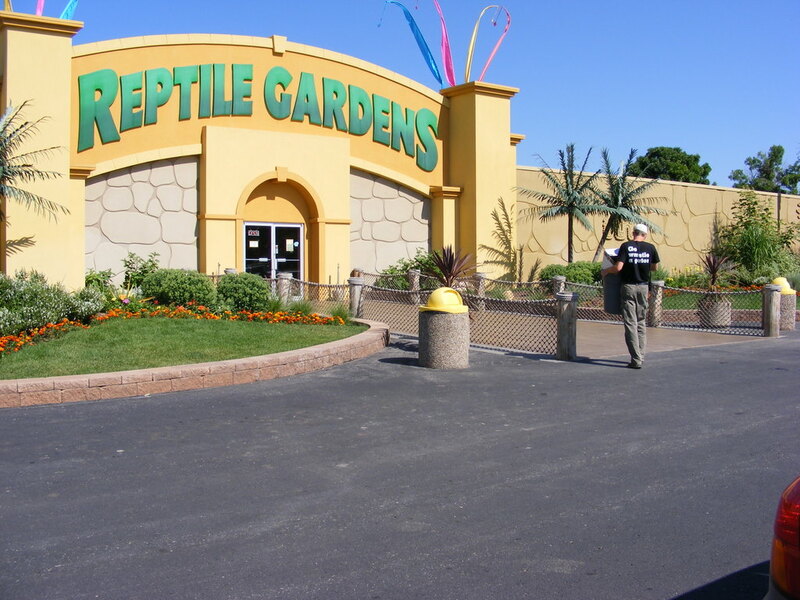 I am sure that I will be going to Reptile gardens to visit Snappy for many years to come. I got the foto of your son Morgan from stock.xchng and used it for a Layout for my “Merry Fairy”-Kit. Hope this is ok for you. You can see the LO with your sweet son on my blog http://tempusfug.blogspot.com.